This Small Minnow Mayfly is a female imago that possibly belongs to the genus Plauditus. The word "imago" refers the last stage of an insect during its metamorphosis. Depending on the species, adult mayflies live from a few minutes to a few days (German "Eintagsfliege" meaning literally one-day fly). The mouthparts and the stomach are present in adults but are not used. They have paired genitalia, i.e. the male has two penises and the female two gonopores. 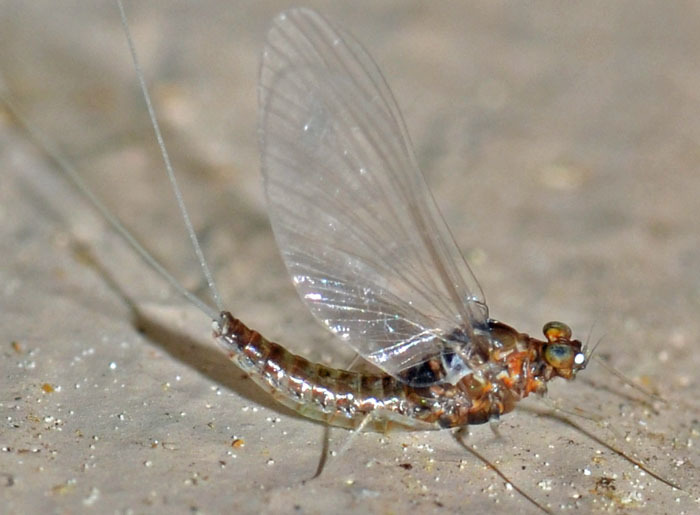 Often mayflies locally mature at the same time and then cover--in very large groups--every available surface.